This work presents an adaptive mesh generation strategy for parametric surfaces. The proposed strategy is controlled by curvatures and the error measured between the analytical and discrete curvatures guides the adaptive process. The analytical curvature is a mathematical representation that models the domain, whereas the discrete curvature is an approximation of that curvature and depends directly on the used mesh. 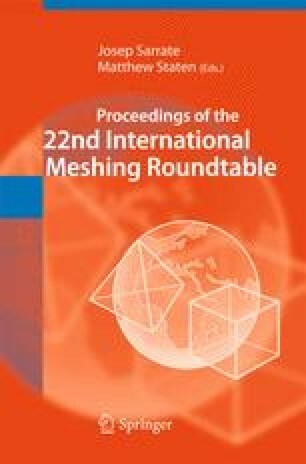 The proposed strategy presents the following aspects: it is able to refine and coarsen regions of the mesh; it considers the local error measures to ensure good global quality; it ensures good transition of the mesh and it deals with any type of parametric surfaces since it works in the parametric space.